Exploring artistic style with watercolours, sharpies & imagination! In Wallace Consolidated’s Grade 5/6 class, students place a particular focus on individual styles during their explorations in art. Students explore their own personal style while utilising various elements, materials, and techniques. 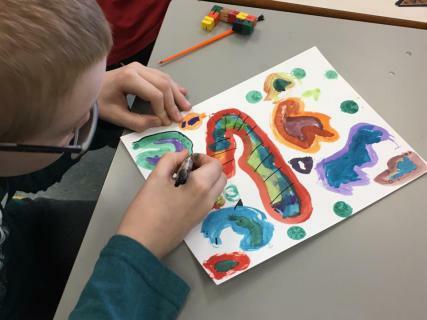 Focusing on colour and form, the 5/6 students explored the elements of art in the creation of watercolour doodles. The students created the coloured forms and were then challenged to add detail, or create a series of figures out of their painting. The coloured forms were brought to life and given emphasis with Sharpies. Using Sharpies gave students the opportunity to give their piece more character and definition. The end products were individual to each student and highlighted their personal artistic styles!